I never really paid attention to Paradox because I thought it would be too rigid with all those straight lines, but now that I've played with it a bit, I think it's going to become a favorite, there is so much to explore, and it's a joy to draw. 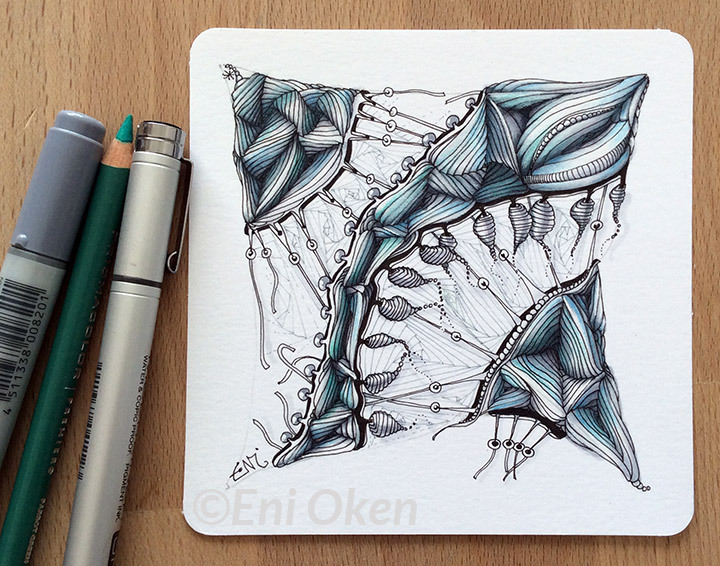 After playing with it a little while for the Shading Zentangle® Facebook group Paradox Challenge, I saw enormous potential for organic construction along with interesting shading. Some people see paradox as a pyramid, that is, the smaller area grows upward, but I couldn't help but seeing most of it as going inward. Other tangles in the tile are zinger (becoming a huge favorite) and pokeroot. As usual, I added my own personal challenge to the mix: I wanted to create as paradox as organic as possible, without any straight lines. I purposely curved and jiggled the lines, pulled and stretched to see how well it would hold. I'm super happy with it, looks like some sort of alien planet artifact! The piece was entirely shaded with gray copic markers, no pencils. Behind the main lineart, I added gray paradox lines using a gray copic fineliner. Find out more about my favorite shading supplies here. 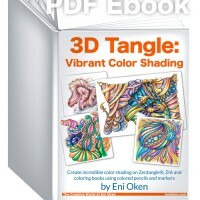 Finally, tones of blue green colored pencil were added using white pencil blending techniques described in my book 3DTangle Vibrant Color Shading. One of my favorite things about shading with markers is that it's relatively fast compared to pencil shading. The draw back is that the shading is not that easy to blend and worse, it's hard to get into those little dark crevices with the fat marker nib. To really get into those crevices, I use a gray fineliner by Copic. This image is probably enlarged 3 to 4 times the size of the original tile, depending how you looking at it.